Oriental Beauty Oolong Tea is an oolong tea which is also known as Bai Hao Oolong or Champagne Formosa. The name Bai Hao means white tip and refers to the small tender white buds that are picked along with the top two leaves. A little history, the origin of this name dates back to the early 20th century when a British tea merchant presented a sample of this tea to Queen Elizabeth II. From there, the Queen named this tea as Oriental Beauty. 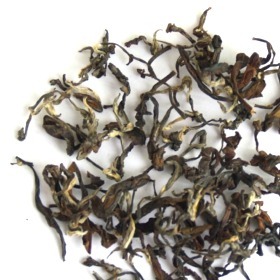 Oriental Beauty Oolong Tea has a sweet smooth taste with a slightly baked and floral aroma. Organically grown. Sweet smooth taste with a slightly baked and floral aroma. Dark Brown twisted and curled tea leaves. The steeped tea is golden brown in color. A nice full bodied oolong, not terribly impressive, but still a nice afternoon oolong with a slightly roasted flavor. My first Oriental Beauty. I still prefer Darjeeling to Oriental beauty but this does have that mixture of sweetness and astringency of black teas.